It took me 7 months to pluck up the courage to write about what I believe is ‘Australia’s most flexible role’. 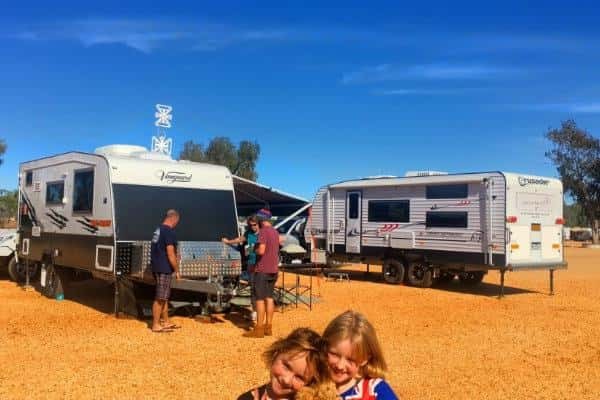 If you didn’t catch the article, in summary: My husband and I are travelling around Australia in a caravan with our 2 young girls, all while I continue to work fulltime and fully flexibly for an incredible company (avt) truly leading the way when it comes to workplace flexibility. Since sharing the article, I have been inundated with people reaching out to share their thoughts about the article. Everyone has been incredibly positive about it, most wanting to know more about how we make flexibility work. The questions have come in thick and fast. How do you cope with the internet in remote areas? How many hours do you actually work a week? Are you getting enough time to enjoy the country? What does your internet cost each week? What is your actual job (position in the company)? It got me thinking about work-life balance and how it applies to the caravan of courage. I’ll admit, since having children, I have always taken a more flexible approach to work and I’m definitely one of those mums who is a better mother when I integrate career and family, so work-life balance for me is more about work-life integration. So how does this work while living in caravan and travelling around Australia? Trust! 100% unconditional bidirectional trust between my employer and myself. I don’t count hours. We’re an agile organisation and plan projects and with trust and the tools (we use Atlassian’s JIRA / Confluence) to deliver. It has totally transformed the way we work. Transparency! With great trust comes full transparency. If we’re out at the beach, bushwalking or riding our bikes and the phone rings, there’s no secrets, I don’t pretend I’m sitting at my ‘desk’ working. If I can talk, I talk, if I can’t, I’ll organise another time. I’m rarely unavailable and equally rarely tied to my phone or a desk. Flexibility! With unconditional trust and transparency, we’re empowered. I’m an early bird and equally a night owl, so I use the quiet moments to get work done. I have learnt to appreciate the value of this ‘space’ and I power through tasks all without distraction. It means I often get tomorrow’s work done the night before, freeing up time to spend it exploring the latest town we pull into. It’s pure GOLD! Planning! I’m that daggy person who lives by the 6P’s (proper prior preparation prevents poor performance) and while I hate to admit it, without it, the typical day would be more chaotic. Don’t let me fool you, there is chaos and plenty of it, that’s all part of the fun and adventure. There’s definitely no typical day, it’s far from linear, which makes it hard to define what a working day looks like. Some days I’m in meetings for hours, other days I have the freedom to be more flexible, our family work together around anything concrete in my calendar and plan around it. We overlay home school with meetings and we all just get on with it. Some days we’re in libraries, others we work from the caravan, sometimes we’re even on the beach! Our girls are obsessed with audiobooks and it provides me with plenty of time to get stuff done while driving between towns. Family First! My husband is the enabler, he does everything, from the driving (and I literally mean ALL the driving! ), the planning, cooking, setup and pack down. He’s also the home school ‘teacher’, organising the weekly lessons. With hubby holding the fort, he’ll get our girls involved in pack down and it makes for great ‘education’, while I use this time productively. I think he works harder than I do!! Between my husband, our GM and CEO, they’re all strong advocates to ensuring I keep my workload ‘in check’. We have never had any rules around when or where I work, together we keep it flexible and it’s a big contributor to it being a success. Work-life integration isn’t new, so I can’t claim a stake on it. I Googled it and was both surprised and excited to find many articles about the migration of work-life balance towards work-life integration. It is said that work-life balance creates a sense of competition between two elements. Work-life integration instead is an approach that creates more synergies between all the areas that define “life”: work, home/family, community, personal well-being and health. So how do I keep the balance while travelling around Australia? I prefer to say that we successfully integrate all the areas that define “life” and together with unconditional support, we all achieve success. If you would like to know more, I invite you to reach out to me here by commenting below or check out the article on LinkedIn and message me if you’d like more details. If Instagram’s your thing, we have a Family Gap Year Instagram page.